Trattoria on the Hill (formerly known as Trattoria Roman Gardens) is one of my favorite restaurants in Cleveland’s Little Italy. The food (particularly the gnocchi – oh my God, the gnocchi!!!) is fresh and delicious. And most importantly the prices are very reasonable. Since I had not yet started my blog when I went here I did not take as many pictures as I normally would have. We were there on a Tuesday and the place was pretty full, which is a testament to the fresh food. The bread service with the fresh tomato bruschetta is absolutely divine. The bread was very fresh Italian bread (most likely from Corbo’s or Presti’s) – and the tomato bruschetta was amazing. I couldn’t stop eating it. I’ll take a picture the next time I am there. I ordered the eggplant parmigiano. I asked my friends on Facebook for recommendations, and one of my Italian friends told me I needed to get the eggplant parm. 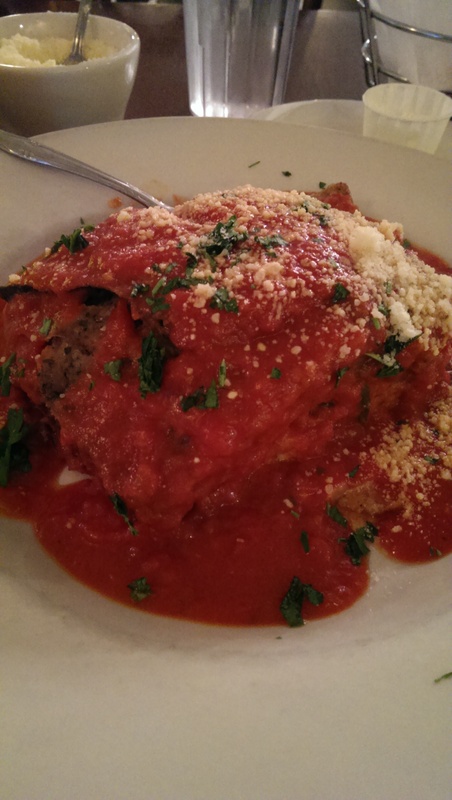 She raved that she had never had better eggplant parm – even at Italian restaurants in NYC. She wasn’t wrong. The eggplant at Trattoria was thinly sliced, lightly breaded and simply delicious. My friend Hélène ordered the gnocchi and let me try some. They were absolutely divine. So good that we were both craving them several days later and made a spontaneous trip that weekend. I have an unwritten rule that I never order the same thing as the person I am eating with, but I broke that rule for these gnocchi. They are a simple potato gnocchi in a sauce of tomato basil, butter and Romano. I had planned on bringing half home, but found myself eating the whole thing. Everyone in the group thoroughly enjoyed their meals. The lasagna is huge and vegetarian-friendly (made with ricotta cheese, spinach and mushrooms – you can order meat sauce if you want a more carnivore-friendly meal). The couple at the other end of the table ordered the linguini and clams and cavatelli with meatballs. Both looked lovely and quite affordable. They definitely enjoyed their meals as well. No one had room for dessert, although the desserts served to other tables looked quite delicious. On a trip there several years ago I had tried the Baby Bay Scallops Pesto with Linguini, which Rachel Ray had recommended on her show Tasty Travels. I would probably stick with the dishes with tomato sauce, because Trattoria on the Hill is known for their tomato sauce. It is fresh and delicious – and available for purchase. The service was quite attentive, and they had no problems giving us separate checks. I like this place so much that my translators group is planning our Annual Meeting there in the fall (based on my and Hélène’s suggestion). But I will definitely be back before then! I remember having access to all of this food back when I was a student at Case Western. I haven’t been back to Trattoria in years, but your description and pictures may just prompt me to re-visit and re-evaluate such a memorable Little Italy institution.